Exquisite Taste - Spectacular Choice! It's a one-of-a-kind, contemporary home in the prestigious Palisades Ski-In/Ski-Out neighborhood of Kirkwood Mountain Resort. Is it the nicest home in Kirkwood? One would have to say, "Yes!" 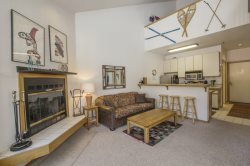 Of the three Ski-In/Ski-Out Palisades homes, this is one of two for rent in which occupants really can ski to the chair lifts. When conditions are right, a groomed spur makes it easy to come and go directly from the backdoor mudroom. It is the kind of alpine home found in the Rocky Mountains with the finest custom craftsmanship and premium amenities. The attention to detail, style and design is remarkable and satisfies the need for top level treatment from concierge service to the on-mountain experience. It has spectacular views of the surrounding valley from almost every room. Kirkwood has a European ambiance with a horseshoe valley with a expansive meadow below and nearly 10,000-foot-tall peaks above California's finest ski slopes. Views of Red Cliffs with its lustrous crimson sunsets, morning sunrises over Caples Crest and Glove Rock atop of a backdrop high above the Palisades is the setting to look forward to when calling this your home for your vacation time. This is a 4-bedroom home with 6 baths, 4,000 square feet and sleeps 12. The garage/front entry level hosts a mudroom with cubbies and seating where you can store your skis, boards, boots and poles. The first level features a main living/game room complete with a shuffleboard, 63-inch flat screen, master suite with steam shower, bunk room, laundry, powder room and a large deck with wrought iron patio furniture and views looking east. The next level up is where you can enter and exit through the mudroom and hit the slopes! There is a great room with another living area, dining for 12 and gourmet kitchen. On this level, there are two more master suites exquisite furnishings for your comfort. This home was recently owner occupied 100% of the time for over a year. Now the owner and his guests often return for weeks at a time in the early winter, spring, summer, and fall to enjoy all the skiing, hiking, and biking the mountain has to offer. As such this home is perfectly maintained and guests will not want for any amenity. Enjoy an after-ski soiree next to a warm fire with friends, cocktails and appetizers coming from the open kitchen. Then enjoy a gourmet meal at the dining table for 12. The entire home is beautifully decorated throughout with plenty of space to have some private time as well. The kitchen is fully equipped with a Dacor 6 burner cooktop, Kitchen-Aid double oven, built-in refrigerator, microwave, Bosch dishwasher, pantry and soapstone counters. This home offers a small office with a wireless printer. A home automation system complete with AirPlay WiFi, music, movies, thermostat control, surveillance cameras (not in bedrooms or baths) and security are part of this smart home. There are games in the chest, a small television and plenty of books to entertain the family. Free music options include Tune-In internet radio that streams thousands of songs from local media, or stream your own music using AirPlay and Wireless Music Bridge. There are two Bluray DVD players and hundreds of onsite DVDs. AppleTV is available in addition to NetFlix access. Each master suite has a king bed and a private bath. The lower level master suite has an Eastern King with television and a steam shower. The first upper level master suite has a California King, Kohler air bubble whirlpool tub and separate shower, porcelain tile, double sinks, mission style furniture, back deck and a locked master closet. The third master suite also has a California King and private bath. Downstairs, the children can sleep in the bunk room for 6. Two living areas help separate two groups in their particular entertainment choices. The lower level living area features a 63-inch flatscreen, shuffleboard, DVD library and a large deck to relish Kirkwood's pristine, crisp air. Expedition Kirkwood w/ private guides, cat tours, backcountry training and education, and kids programs. *Please Note: This home is not recommended for children due to stairways, ledges and climbing risks. Parents need to take special care to supervise against personal injury. There are no protective features for these risks. This home is for sale. Please inquire about your home away from home in the mountains! Oh, my! Kim and Joan were fantastic! We were supposed to be in Yosemite and they helped us salvage a vacation by finding three homes for our group of 26. I would highly recommend your company to anyone! The property was simply gorgeous. It was so appropriate for our three families. The bunk room for our six boys was perfect. They loved having "their own" living room/game roomand there were nonstop games and movies all weekend. The kitchen and upstairs living space was a delight for preparing and enjoying group meals. The oversized tub was most appreciated after the kids swam across Caples Lake on their "flotilla." So much space and so beautifully appointed! We rented this home for a family reunion and couldn't have been happier - highly recommend. We had three sets of parents an five children but the home never seemed crowded. The amenities are great - there was an elevator for the grand parents, an Xbox and shuffle board for the older kids, and board games for the younger kids. The kitchen was better equipped than our own home. We did most of our own cooking or barbecuing but the Kirkwood Inn is close for a quick bite and we really like Stonefly in Markleeville which is city quality fine dining and a beautiful drive. The ski lifts were closed for the season but we could see the ski run right off the back deck. We will be back the winter! Thanks again for a great stay. There is a 50% deposit due at the time of booking. The remaining balance will be automatically charged 30 days prior to arrival for nightly rentals. Ski lease option available.